Maguha kea Alysha – the area where Sandy and Martin went last weekend. Sandy wrote it was the worst road they have ever been on and the most isolated area to which they have been. 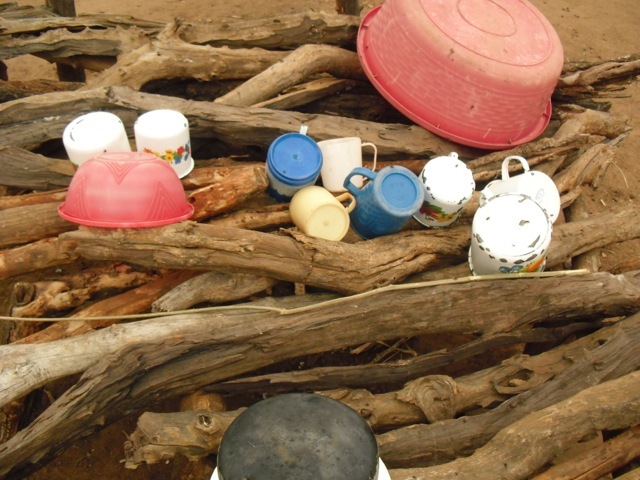 Photos are of the dish-drying rack (they only had cups, no dishes). 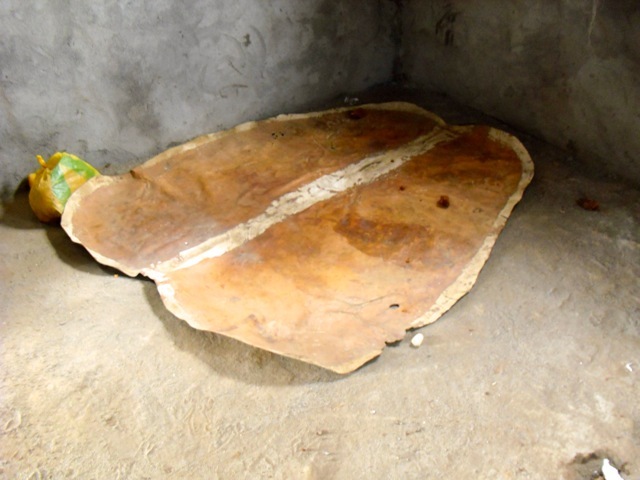 The next photo is a bed made of animal skins, the most popular bedding, especially during the rainy season. 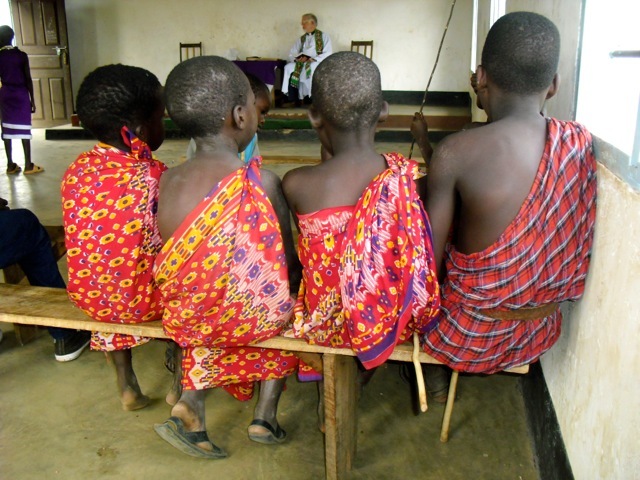 And last, my favorite and what I want to make a painting of – little boys sitting patiently in church. Because of the drought, we have added the Primary School to the Maize program. there are 22 employees at BSPS (includes faculty and staff) in addition to the children. Each faculty member will receivea 100 kg bag of corn and this will also cover the porridge for daily meals for one year for the children. Other wonderful news!! 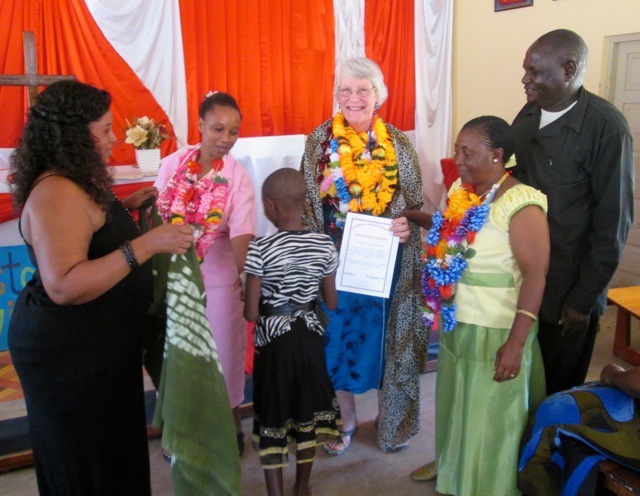 The folks in Wyoming have obtained a grant of $25,000 for the Primary School. They will use this money to finish two classrooms at the school as well as other needed repairs!!! Thank you everyone, for your continued support of KARIMU. Thank you too, those who bought paintings at my art show, we were able to contribute to Saint Mary Magdalene’s outreach program as well as KARIMU. Why do you suppose everything seems worse at night? Maybe it is the ghoulies and ghosties and long-leggeded beasties and things that go bump in the night. Night before last was one of those nights for me. When I dragged my old bones out of the bed to walk James I adopted a new mantra: “Seek joy.” Barely in from our walk I received a phone call from The Rev. Craig Lister, rector of St. Thomas Church in Sanford, NC, calling to tell me the vestry had voted to give $500.00 to Karimu. The women of that same church have also voted to give $500.00. Psalm 30:6 came bursting into my head: ” Weeping may linger for the night, but joy comes in the morning.” It did ~ joy came in the morning. $1000.00 put us over our $12,000 goal for A-Maizing-Grace. We hit $12,605 this morning. We were $140.00 short last week and Pam Webb (The Reverend Pam Webb) took care of that. She has been a patron saint. Joy! Seek it! Look for it! Pray for it! Remember Anne Lamott’s book that I wrote about: “HELP – THANKS – WOW!” That works for me in prayer, certainly today. The deacons of this diocese had a retreat this past weekend in a most holy place ~ The St. Francis Springs Prayer Center (Franciscan). Since we all live in an age of cell phones, I-Pads, instant communication and sorrowfully instant gratification it was renewing for me to go to a quiet place and meet with fellow deacons along with our bishop and our bishop suffragan elect. Bishop Curry said he has no fire in his belly for capitol campaigns ~ we don’t need big beautiful churches he said. We need to be in the world taking the message of God/Christ to the disinfranchised ~ the poor, the hungry, the sick, the aged. Our altar should be the world, he said. You, through your support ,are making it possible for Jessie and me to do just that. If Sarah laughed when Jesus told her she would bear a child in old age, I laugh at how God gets us. I never liked stewardship time in the church ~ pleading with parishioners to fill out pledge cards, to “up” their giving each year, etc. Now I am a beggar. I am no longer embarrassed to tell the story that I have learned. We put our finger in one dike and another springs open. 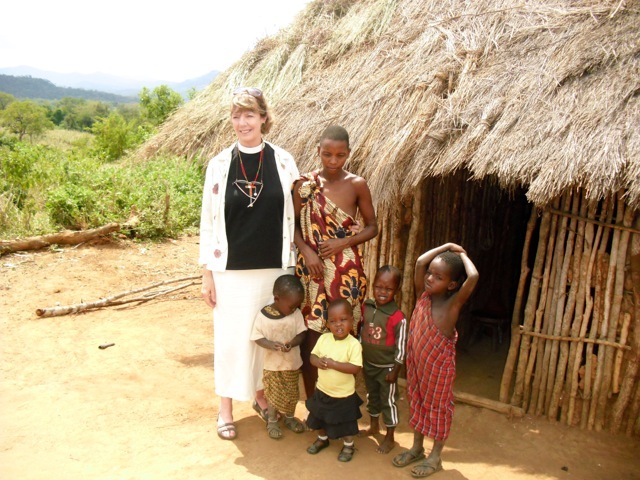 Currently we need funds to sponsor 3 children at Bishop Stanway Primary School. The cost is $320.00 a child. Although we are not going to Africa this summer we still are hard at work for our friends and with good, trustworthy people on the ground we can continue to work on this side of the pond. 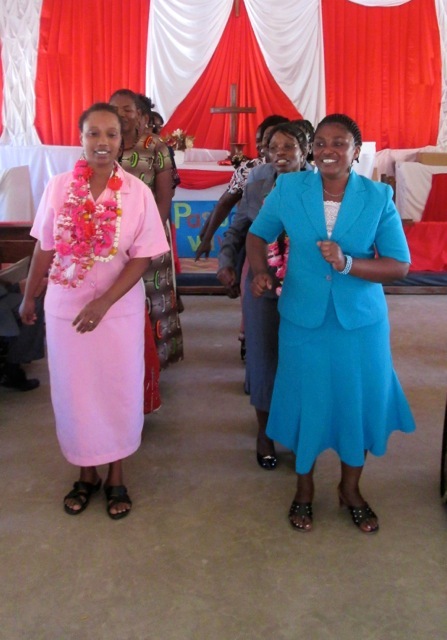 Sandy writes that the Pastor’s Wive’s English classes may be the best thing we have done. We pay for the teacher, classroom, books etc. Read Jessie’s last blog entry. 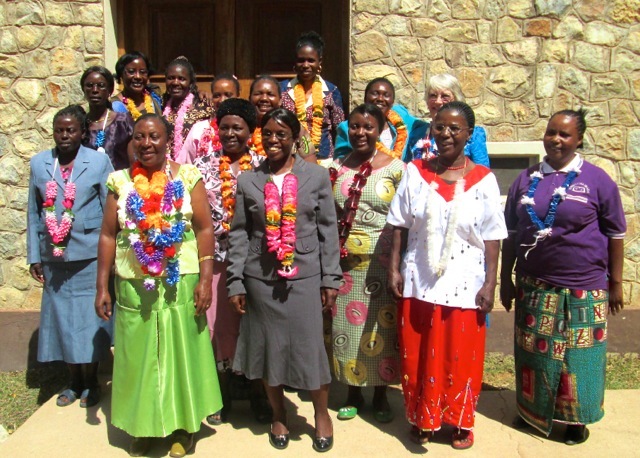 These women want to continue their education to become teachers, nurses, pastors. These are things that can save Africa. We cannot do anything by ourselves. Everything and any amount helps. 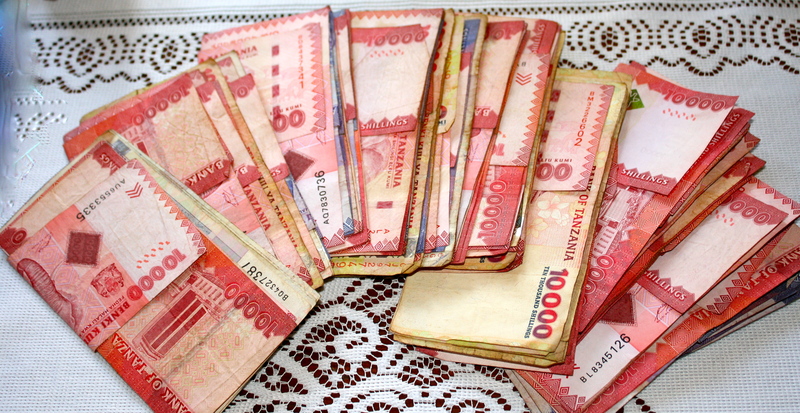 We came home in October with $500.00 in our Karimu account. We now have $20,000. THANKS AND WOW. GRADUATION OF WOMEN’S ENGLISH CLASS! Thank you everyone for your help in donating to Karimu for this worthy endeavour. We are so proud of these women and to Marion, their teacher!! !